Six years, six albums and countless singles, eps and collaborations later, and finally this February – March, we are blessed with a return visit from our favourite royal, Bonnie ‘Prince’ Billy. 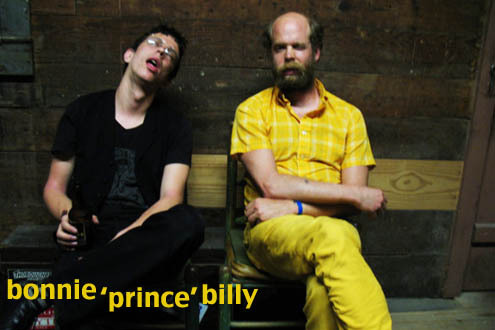 Born Will Oldham in Kentucky USA some 40 years ago, Oldham christened the Bonnie mantle after the dissolution of his previous outfit(s), the hugely influential alt-country outfits Palace Brothers and Palace Music. Since then Bonnie ‘Prince’ Billy has amassed a catalogue of some twelve studio-albums, all weirdly inventive takes on the roots genre: country-western, bluegrass, Appalachian folk, and which has seen cover versions from the likes of Johnny Cash, Cat Power and Mark Lanegan while the list of renowned public admirers would fill a press release on its own. His most recent release, Wolfroy Goes to Town, continues in his own unique tradition but in true maverick style moves ever sideways from expectation, this time with the addition of vocalist Angel Olsen – a solo performer in her own right – and guitarist Emmett Kelly; Billy’s most recent consistent collaborator and the one-man band known as the Cairo Gang. It is these performers plus drummer Van Campbell who will be joining the Bonnie ‘Prince’ Billy on this Australian tour. Live one can never know what to expect from Bonnie ‘Prince’ Billy other than to hugely entertained. Call it country, call it folk, call it what you Will… it’s safe to say that there is nothing out there quite like Bonnie ‘Prince’ Billy. Tickets for Melbourne & Castlemaine on sale Monday 21st November @ 9am. All other appearances on sale now. www.sydneyoperahouse.com | ph: 9250 7777 (transaction fees apply).